I thought the day would never come. Okay, I'll be the first to admit it: in some ways, my wait has a pathetic quality to it. Four years of longing. Four years of mail-ordered coffee, jeopardizing freshness. Mine is likely a passion out of proportion to its cause. Maybe. But the day did come. The old Crossroads Mall in Boulder was demolished and in its place the new 29th Street Mall has arrived. And one of its new denizens is none other than...Peet's Coffee and Tea! An embassy of California's Bay Area has arrived. I walk in there, inhale the deep-roasted aromas of newly arrived beans, and I'm home. It's been a joy to celebrate the arrival of Peet's with my new friends in Boulder. I find we have a new connection. I'm struck by how many members of First Presbyterian seem to frequent the place. 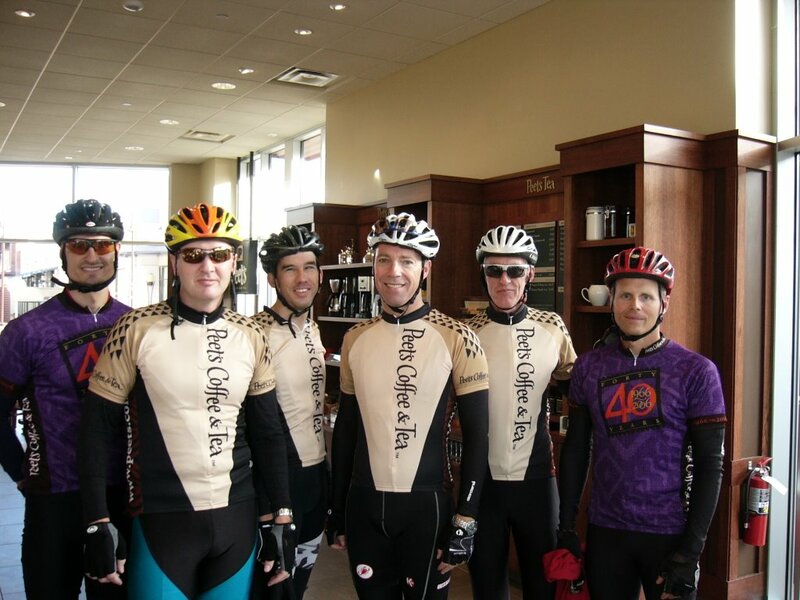 Recently, the Saturday morning bike group I'm part of did a "Peet's Ride". As you can see, we snapped a picture of the event. It captures the "Crossroads" experience for me, the alignment of many of the loves in my life: for cycling, for good coffee, for meaningful connections in the context of Christian community, and for a non-threatening bridge to reach out to others beyond the church context. Fun! ok, biker geeks, i used to live around the corner from the original peet's in berkeley when carl was here. this original location was also a magnet for cyclists. the most arrogant, obnoxious, poser-cyclists, with the most expensive bikes known to man. it was a total scene. my roommate surmised that very early in the morning, these cyclists would put their multi-thousand dollar bikes on the back of their cars, drive to peet's, lean their bikes up against the wall, and pose until late in the day, at which point they would load their bikes back on their cars, and drive home. i'm sure your cycling rides with car have much more integrity. that said, i suggest you buy a pound of arabian mocha java. it rocks. I have it from a reliable source (my sister) that Carl does not smell at all like spritzer water after a ride. This year's Holiday Blend rocks, BTW -- enjoy your Peet's and your indie barista joint, too, Carl. Yes, Mitali, the indie barista joint...that would be Joe's Espresso, which I'm sadly overdue in visiting. While Peet's does great drip coffee, IMHO, their espresso drinks, while above average, cannot touch Joe's in terms of consistency and latte art. BTW, your Newton barista, a woman with spiky blond hair, now works at our Peet's in Boulder--between Newton's transplants and Chico's (in terms of Boulder Peet's employees), we're well covered!